Happy Tuesday, everyone, and happy belated 4th of July! I hope you all had a great weekend, celebrating our independence. It was a great weekend for relaxing, laughing with friends, and just enjoying the time off. I hope you all had a wonderful time! 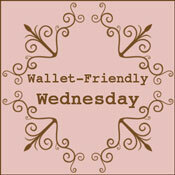 Tomorrow isn't just Wednesday—it's Wallet-Friendly Wednesday! Every week, I feature frugal projects on WFW. If you have a fun, budget-friendly bargain shopping find, thrift store deal, DIY project, side-of-the-road pick-up, consignment shop steal—ANYTHING you've done that's saved your money—don't forget to link up tomorrow. It opens early, and stays up all week long. Next Wednesday, I'll feature a project from this week's link up, and it could be yours! So, grab the button and get blogging about your fabulously creative and frugally-conscious ideas. Then, come back here and link up tomorrow, July 7! oooo what a great idea!! I love wallet free days and I've got a great diy frugal project for tomorrow to link up with! thanks for stopping by!